We’re now two weeks into training, with the third workshop this Friday digging straight into script-writing. It’s hands-on all the way! The first two workshops opened with sessions on story-telling. The first led by the traditional North Queensland story-teller, Boori Monty Pryor, and writer / Director Meme McDonald. The idea was to provide the team with not just the basics of story-telling, but the different ways stories are told and can be told. This would help them identify their own stories and the means by which they may be communicated, first by discovery (finding the story), sharing it (road-testing it with others) and writing it up (working it into a script). Kobra, Boori and Ahmadi perform a story of the arrival of the first stinging bees to 'country'. Boori had not only taken the time to learn where our team had come from, he had them up and on the floor performing a traditional story about the arrival of the bees that stung. Prior to colonization, Boori explained, his people would eat honey and never be stung. Since colonization, a new type of bee arrived. Not only had they to learn how to eat the honey and protect themselves, they had to protect each other. The simple act of feeding one’s hunger with honey had become hazardous. A simple metaphor, without pointing any fingers, nor resorting to grief and calamity, Boori described the effect colonization had on the first people’s of this country. It was compelling! And in doing so, by listening to each team member tell something of their own country and attachment to land, such as Farkhonda’s bowl of sand from Bamiyan she runs through her fingers every morning, or Sahema’s mother burning the root of an ancient tree to clear the start of every day, Boori literally welcomed them to ‘country’, acknowledging their pain, their loss and daily grieving, but reminding them of the value of tradition in keeping community and family whole. 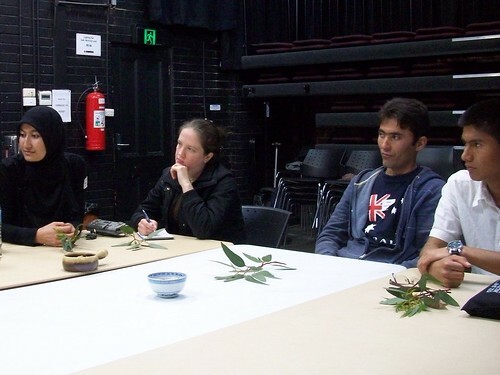 By the end of the morning session almost everyone had a small branch and leaves from a gum tree. be on the look-out for stories as they may appear where one least expects. I got a lot out of this day with Boori and Meme too. I’d found myself thinking about the story of the bees and the more I thought about it the bigger it got! From such a simple metaphor an entire history of persecution and discrimination was told, and would continue to unravel. I went back to my last doco series, Sarawak Gone, and saw that I’d told stories, but I’d not left viewers with a whole lot to go away with other than perhaps despair. I wasn’t entirely happy about that, but I was excited about what I’d learnt, what we’d all got from Boorie and how this would translate in the projects we’re to create over the coming months.